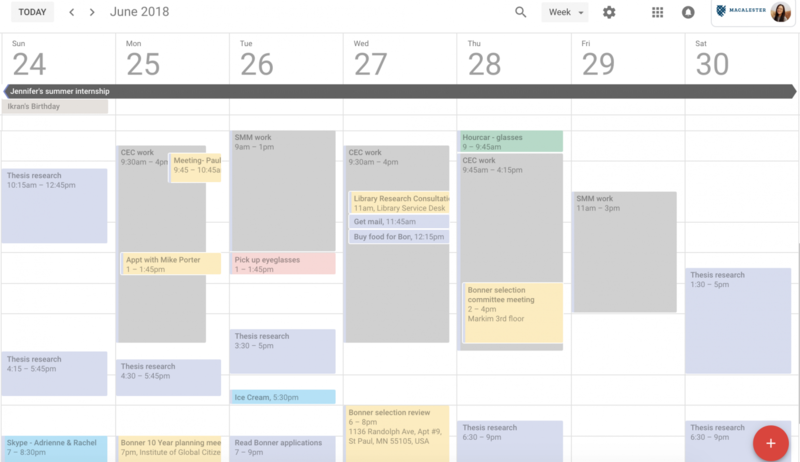 In case you’re not aware of my obsession, I’m in love with Google Calendar. So I’m going to write an ENTIRE blog post about my love. I don’t even remember when I started using it. The end of high school? Definitely by the first week of college. 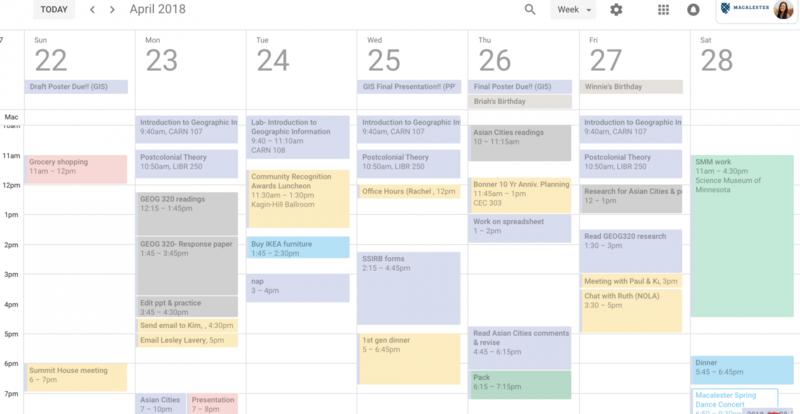 Aside from just using it to keep track of classes, meetings, and events, it’s also a great way to visually manage time. (I’m a super visual learner) I block off time for homework sessions. And when things get really hectic, I even block off time for meals. 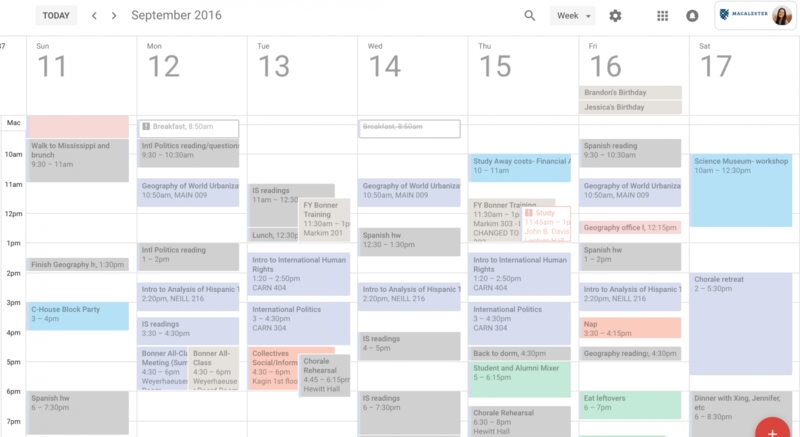 My favorite part about Google Calendar is being able to go back in time and read my schedule like a diary! 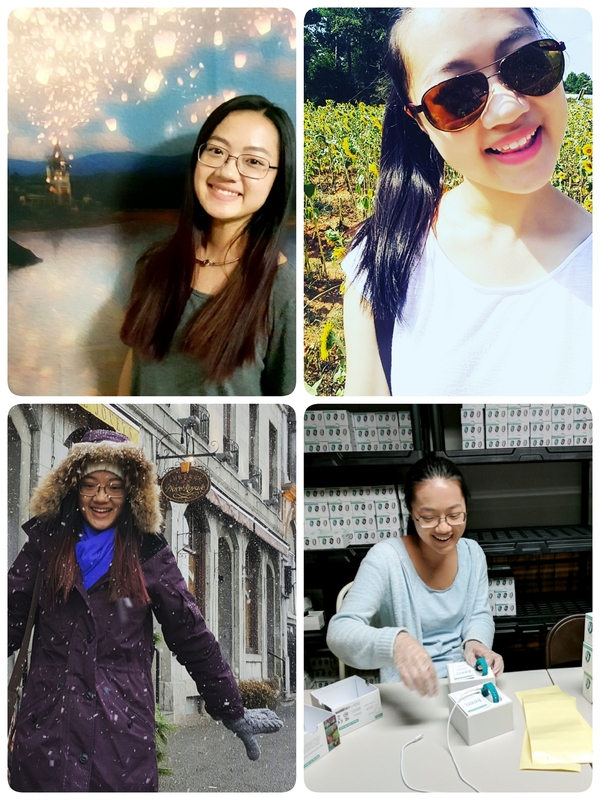 Last week, I was Skyping with Jennifer and we were going down memory lane. I’m not sure what triggered this conversation, but since both of us knew that I keep every record of my life on Google Calendar, we decided to go back in time together. Looking at the screenshot above, Sep 5th, 2015 was the day that Jennifer and I officially became friends. Jennifer forgot her phone at the Minnesota State Fair because we ended up talking for a good two hours and she didn’t realize it until we got back on campus. Likewise, Google Calendar lets me remember the good/bad/random occurrences in my life. It’s so precise to the point that if a meeting yesterday was from 3-4pm, for example, and I scheduled it for 3-5pm… I would go back into my Gcal and correct the time so that I have an accurate record for the future. Continuing on that note, Google Calendar remembers when I visited Chicago for the first time, talked at a professor’s house for 7 hours, and turned in my first college paper. I love it. Moving onto the more practical aspects, I love that Google Calendar can have dual time zones. Jennifer and I studied abroad different semesters, so calculating the time difference is always difficult when we’re finding time to video chat. It’s helpful when there are 2 time zones that you constantly use. Unfortunately, it can’t take 3 time zones simultaneously. If your Gmail is part of an organization (ex. my Macalester .edu email uses Google), you can search for others’ calendars. It makes scheduling meetings SO. MUCH. EASIER. My advisor loves it when I check his calendar ahead of time and just schedule myself in when I need academic advice. When I was trying to schedule a student org gathering during for 14 people, EVERYONE was on Google Calendar and I managed to find THAT 3-4 hour slot on people’s calendars on a Saturday night for a movie. All of my Gcal events are set with an automatic notification 10 minutes beforehand (you can change the timing of notifications). Since I sync my Gcal with my phone calendar, these reminders are sent to my phone as well. This is especially helpful if the event is at a location that’s unfamiliar and I need to see the address again. There are many other features that I LOVE about Gcal that I didn’t write about or else the post will go on forever, but I hope that you found this post humorous and insightful at the very least! How do you keep track of your time? 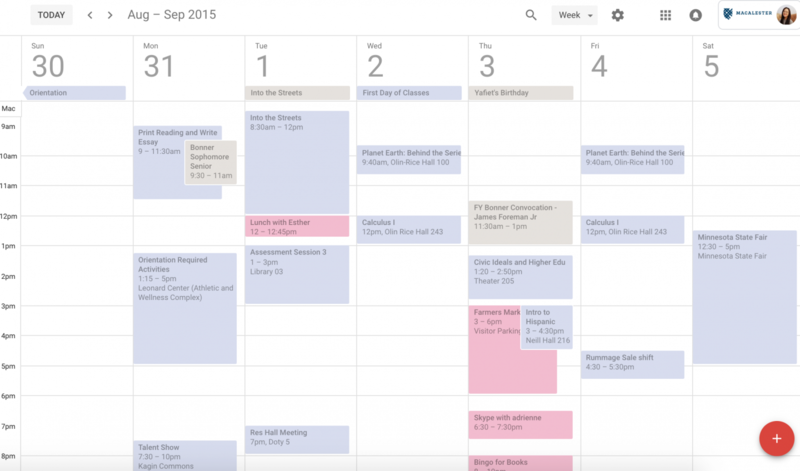 Do you use Google Calendar or iCal? Do you prefer handwritten notes on a planner? Let me know in the comments! plan of a user in his/her brain that how a user can be aware of it. This was super helpful and I am definitely going to start using GCAL. This would make my life so much more organizeddd! Follow my blog at http://www.alexishoots.com also.